Herring are forage fish in the wild, mostly belonging to the family Clupeidae, but they are also an important food for humans. Herring often move in large schools around fishing banks and near the coast. The most abundant and commercially important species belong to the genus Clupea, found particularly in shallow, temperate waters of the North Pacific and North Atlantic Oceans, including the Baltic Sea, as well as off the west coast of South America. Three species of Clupea are recognized; the main taxon, the Atlantic herring, accounts for over half the world's commercial capture of herrings. Herrings played a pivotal role in the history of marine fisheries in Europe, and early in the twentieth century, their study was fundamental to the evolution of fisheries science. These oily fish also have a long history as an important food fish, and are often salted, smoked, or pickled. Herring are very high in the long-chain Omega-3 fatty acids EPA and DHA. They are a source of vitamin D.
Water pollution influences the amount of herring that may be safely consumed. For example, large Baltic herring slightly exceeds recommended limits with respect to PCB and dioxin, although some sources point out that cancer-reducing effect of omega-3 fatty acids is statistically stronger than the cancer-causing effect of PCBs and dioxins. The contaminant levels depend on the age of the fish which can be inferred from their size. Baltic herrings larger than 17 cm may be eaten twice a month, while herrings smaller than 17 cm can be eaten freely. Mercury in fish also influences the amount of fish that women who are pregnant or planning to be pregnant within the next one or two years may safely eat. Herring has been a staple food source since at least 3000 B.C. There are numerous ways the fish is served and many regional recipes: eaten raw, fermented, pickled, or cured by other techniques. A typical Dutch delicacy is Hollandse Nieuwe (Dutch New), which is raw herring from the catches around the end of spring and the beginning of summer. This is typically eaten with raw onion. Hollandse nieuwe is only available in spring when the first seasonal catch of herring is brought in. This is celebrated in festivals such as the Vlaardingen Herring Festival and Vlaggetjesdag in Scheveningen. The new herring are frozen and enzyme-preserved for the remainder of the year. 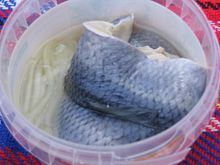 The herring is said to be eaten "raw" because it has not been cooked, although it has been subjected to a degree of curing. The first barrel of Hollandse Nieuwe is traditionally sold at auction for charity. Very young herring are called whitebait and are eaten whole as a delicacy. In Sweden, Baltic herring ("Strömming") is fermented to make surströmming. Pickled herrings are part of Scandinavian, Nordic, Dutch, German (Bismarckhering), Polish, Baltic, Eastern Slavic and Jewish cuisine. Most cured herrings uses a two-step process. Initially, the herrings are cured with salt to extract water. The second stage involves removing the salt and adding flavorings, typically a vinegar, salt, sugar solution to which ingredients like peppercorn, bay leaves and raw onions are added. Other flavors can be added, such as sherry, mustard and dill. The tradition is strong in Scandinavia, The Netherlands, Iceland and Germany. In the Philippines, dried herring is popularly eaten during breakfast, along with garlic rice and eggs. A kipper is a split, gutted and cold smoked herring, a bloater is a whole gutted and cold smoked herring and a buckling is a whole herring, gutted apart from roe or milt and then hot smoked. All are staples of British cuisine. According to George Orwell in The Road to Wigan Pier, the Emperor Charles V erected a statue to the inventor of bloaters. Smoked herring is a traditional meal on the Danish island in the Baltic Sea, Bornholm. This is also the case in Sweden where one can get hard fried/smoked "Strömming" named "Sotare" in places like Skansen, Stockholm. In Scotland, herrings are traditionally filleted, coated in seasoned pin-head oatmeal, and fried in a pan with butter or oil. This dish is usually served with "crushed", buttered, and boiled potatoes. In Sweden, herring soup is a traditional dish. In Southeast Alaska, western hemlock boughs are cut and placed in the ocean before the herring arrive to spawn. The fertilized herring eggs stick to the boughs, and are easily collected. After being boiled briefly the eggs are removed from the bough. Herring eggs collected in this way are eaten plain or in herring egg salad. This method of collection is part of Tlingit tradition. Avruga caviar Spain Avruga is marketed by the Spanish company Pescaviar as a caviar substitute. It is made from herring (40%), salt, corn starch, lemon juice, citric acid, xanthan gum, sodium benzoate, squid ink and water. Unlike caviar, it does not contain fish roe. Bloater England Popular in the 19th and early 20th centuries, bloaters are now rare. They can be contrasted with kippers. Kippers are salted and cold smoked overnight while bloaters are salted less and not smoked for so long. Kippers are split and gutted before smoking while bloaters are smoked whole without gutting. Kippers are associated with Scotland while bloaters are associated with England. Bloaters have their own characteristic slightly gamey flavor and are called "bloaters" because they swell or bloat during preparation. Brathering Germany A dish of fried marinated herring. A common recipe starts with fresh herrings with the head and gut removed that are breaded or turned in flour, fried and then pickled in a marinade of vinegar. The pickled herrings are then boiled briefly in water containing onion, salt, spices like pepper, bay leaves, mustard seeds, and a little sugar. The herring are served cold with bread and fried or jacket potatoes]. Buckling European A hot-smoked herring similar to a kipper or bloater. The guts are removed but the roe or milt remain. Buckling is hot-smoked whole, as opposed to kippers which are split and gutted, and then cold smoked. Bucklings can be eaten hot or cold. Dressed herring Russia A layered salad of diced salted herring covered with alternating layers of grated boiled vegetables (potato, carrot and beet root) and chopped onions. Optionally includes a layer of fresh grated apple. The final layer is beet root covered with mayonnaise, which gives the salad a rich purple color. Often decorated with grated boiled eggs. Popular in Russia and other countries of the former USSR, where it is traditional at New Year and Christmas celebrations. Also known as herring under a fur coat or just fur coat. (lit. fish sandwich) Germany A sandwich or roll made with fish and onions, sometimes also made with remoulade and pickles. Most commonly made with bismarck herring or soused herring, and eaten in Northern Germany, due to the region's proximity to the North Sea and Baltic Sea. Śledzie Poland Pickled herring with chopped onions, eggs peeled and chopped (hard-cooked), apple - lemon juice, sour cream, garlic, salt and pepper, added to herring and mixed well, Sprinkled with dill or parsley. Served with rye bread. It is also Traditionally served in one of the twelve dishes served at Christmas Eve (Wigilia). Herring roe Japan Called Kazunoko (数の子). Usually, it is served as a part of Osechi in the Japanese new year. Herring spawn Japan Called Komochi-Kombu (子持昆布). Usually, it is served as a part of Sushi or Chinmi. Herring noodle Japan Called Nishin-soba (にしん蕎麦). Hokkaido]. Herring spawn Japan Called matsumae-duke(松前漬け）. Hokkaido]. Kipper United Kingdom A whole herring that has been split from tail to head, gutted, salted or pickled, and cold smoked. ^ Cushing, David H (1975) Marine ecology and fisheries Cambridge University Press. ISBN 9780521099110. ^ Pauly, Daniel (2004) Darwin's Fishes: An Encyclopedia of Ichthyology, Ecology, and Evolution Page 109, Cambridge University Press. ISBN 9780521827775. ^ "What's an oily fish?". Food Standards Agency. 2004-06-24. ^ Zukin N and Zusman M (2013) The Artisan Jewish Deli at Home page 122, Andrews McMeel Publishing. ISBN 9781449441326. ^ Mason, Laura (2004). Food Culture in Great Britain. Greenwood Publishing Group. p. 80. ^ Fearnley-Whittingstall, Hugh; Fisher, Nick (2007). The River Cottage Fish Book. Bloomsbury. p. 168. ^ Bender, David A. (2007). A Dictionary of Food and Nutrition. Oxford University Press. p. 256. ^ "Isle of Man: Nature: Get Kippered". BBC. 27 April 2008. Retrieved 30 March 2011. ^ Partridge, Eric (1983). Origins: a short etymological dictionary of modern English (1983 ed.). New York: Greenwich House. p. 50. ISBN 0-517-41425-2. ^ Organisation for Economic Co-Operation and Development (2009) Multilingual Dictionary of Fish and Fish Products Page 147, John Wiley & Sons. ISBN 9781405157605. ^ "Buckling". Archived from the original on 6 July 2011. Retrieved 30 March 2011. Froese, Rainer, and Daniel Pauly, eds. (2006). Species of Clupea in FishBase. January 2006 version. In praise of the humble herring The Independent, 1 September 2005. En route: Scandinavia; Herring, the Fish That Roared New York Times, 30 October 2002. This page was last edited on 26 March 2019, at 00:17 (UTC).